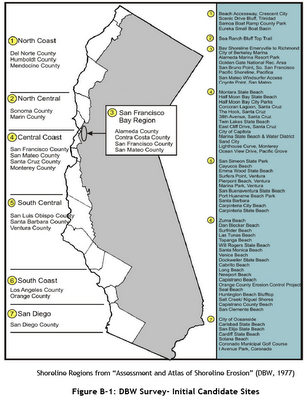 This week the Coastal Sediment Management Workgroup (CSMW) released the California Beach Erosion Assessment Survey 2010 (CBEAS), which reports on the erosion of California coastal beaches and provides a list of sites, called “Beach Erosion Concern Areas (BECAs),” where beach erosion has been identified as a concern to state, federal, and/or local/regional agencies. The report can be downloaded from the Department of Boating and Waterways website. Paul Jenkin, environmental director of the Ventura chapter of the Surfrider Foundation, said people are used to seeing crumbing sidewalks and massive rock walls along the beach — they have forgotten what a natural shoreline looks like. He said that the report is good if it leads to more natural restoration projects like the one at Surfers Point. But he worries that ultimately the fix for the erosion issue will only be more seawalls and attempts to keep the ocean at bay — and that will just further the problem. 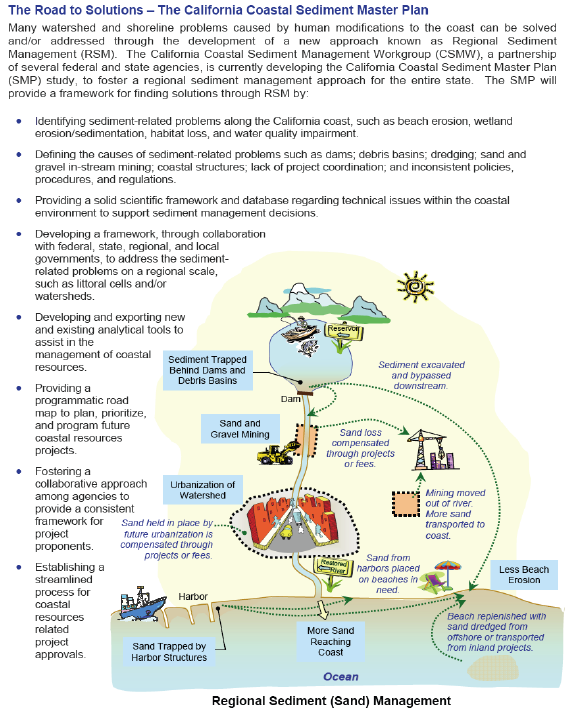 Also this week, Surfrider submitted comments on the DRAFT PROGRAMMATIC ENVIRONMENTAL IMPACT REPORT (DPEIR) FOR BEACON’S ADOPTED COASTAL REGIONAL SEDIMENT MANAGEMENT PLAN (CRSMP) FOR SANTA BARBARA AND VENTURA COUNTIES. This document is available on the BEACON website. The project comprises onshore and offshore developments and consists of sand management, dredging, sand deposition and grading, and the placement of offshore sand retention structures. The individual projects are identified below. A more detailed description of the project components is provided in the Draft PEIR. 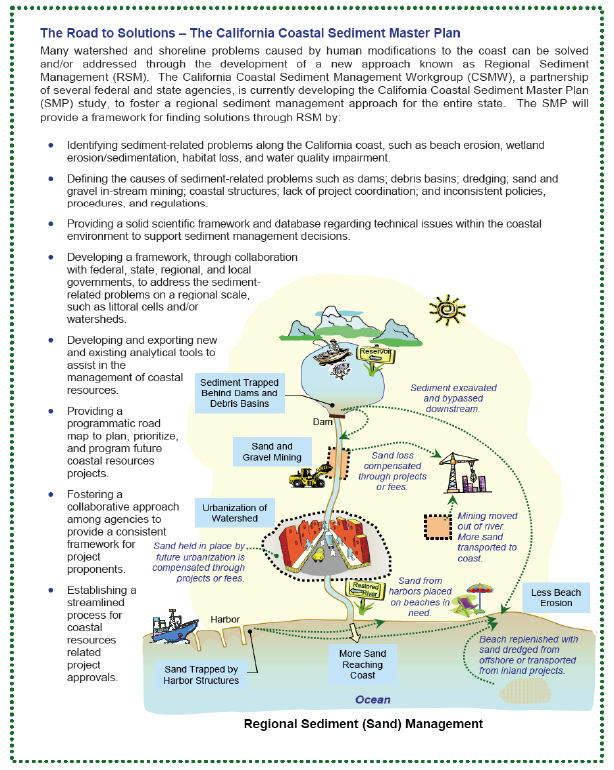 1) Oxnard Shores Sand Management. 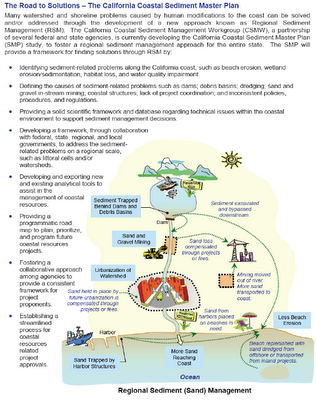 2) Regional Sediment Management Stockpile and Processing Center. 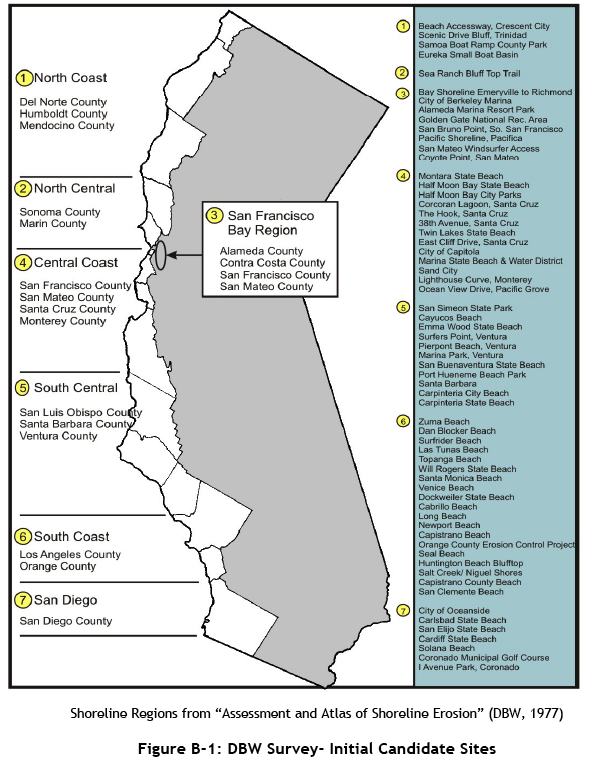 3) Sand Retention Pilot Projects at: Arroyo Burro County Beach, Butterfly Beach, Summerland Beach, Santa Claus Beach, La Conchita Beach, North Rincon Parkway, and South Rincon Parkway. 4) West Hueneme Beach Re-nourishment Longevity Improvement. 5) North and South Rincon Parkway Shoreline Restoration. 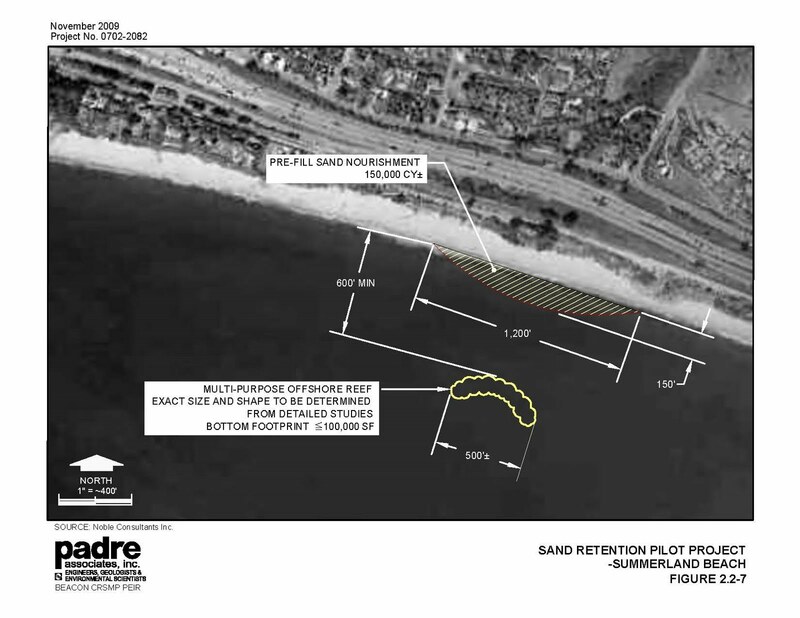 Surfrider has concerns that this plan is primarily a coastal engineering plan, rather than a strategic 'Coastal Regional Sediment Management Plan.' The basic premise that we need 'wider beaches' is flawed – many of the beaches in the region are naturally narrow, bluff-backed, beaches. “Beach erosion” is a result of poor land use planning, and in areas where coastal development has encroached into the coastal zone, damage to property and infrastructure are a predictable inevitability. The proposed CRSMP capital projects mainly consist of expensive structural engineering and beach nourishment projects. To date, BEACON has not been able to attract the huge federal appropriations that it would take to implement the large-scale beach replenishment and sand retention projects described. 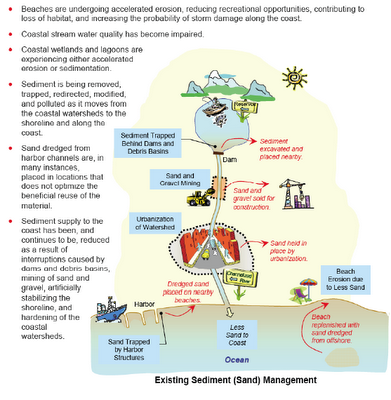 'Recycling' sand before it goes into Mugu Canyon, while in theory may make sense, is cost prohibitive and likely has environmental consequences to ocean ecosystems that may not be immediately evident. The EIR includes a description of the proposed artificial reef pilot project at Oil Piers, although it is not one of the projects in this plan. 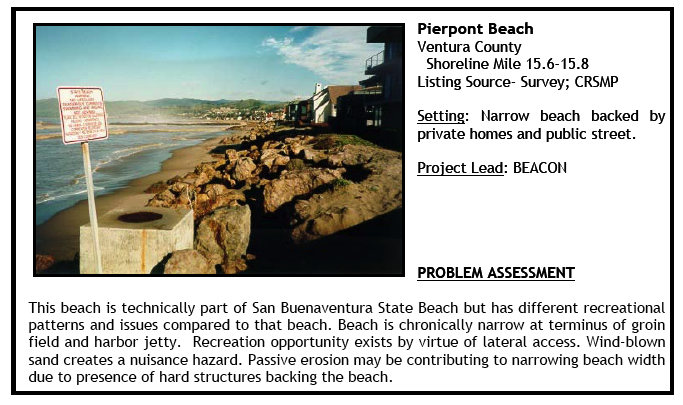 Surfrider feels that until this project is implemented and monitored, it is impossible to adequately assess the potential impacts of large-scale deployment of similar structures. Recent experience on both the West Coast (i.e. Pratts Reef) and elsewhere around the world has demonstrated the difficulty associated with placing artificial reefs in the surf zone, and expenses associated with removal if they fail to perform or otherwise become a problem.